On this day, according to the Martyrology of Donegal, there was a festival in honour of Meithcearn. We can find nothing more to throw light on this saint's memory. The ‘Celtic’ Church: what was it like? In the past, great emphasis was placed on the monastic organisation and nature of the early Irish Church. The theory is that the earlier Roman organisation based around the figure of the bishop and some kind of what today would be called ‘diocesan’ structure was replaced in the sixth century by powerful abbots and abbesses. This monastic structure was also tied to the then political structure. This view has been considerably modified in the last number of years. [ix] While abbots may have set the agenda, bishops seem to have still held the power. [x] The pastoral care of the people seems to have been very much under the direction of the bishop assisted by his clergy. [xi] Monasticism was an important dimension to the life of the early Irish Church but it was not the global phenomenon that has sometime been presented. Indeed, monasticism was growing right across the Christian world, as Christianity was being introduced into Ireland. Patrick himself valued consecrated life and tells us so in his Confessions. But this monasticism was not the structured monasticism of later ages, largely based on the Rule of Saint Benedict. There was discipline in these monasteries and we have evidence of different kinds of monastic rules, but the abbot seems to have been free to mix and adapt these monastic ordinances for his own particular house. It simply cannot be held that all Irish monks were shining examples of heroic ascetical lifestyles. Many of the leading monks came from wealthy families and it would be a mistake to imagine that all of them renounced the privileges that came from their rank in society. Indeed, as has been pointed out by Kathleen Hughes, the remains of meat bones have been found in many monastic sites, which would have been at variance with the monastic rules. [xiii] By the seventh century Christianity is well established in Ireland and dominates the cultural landscape. This society was highly organised and within its hierarchy were many prominent ecclesiastics, who may well have owed their places in this societal ranking to their birth. It is presumed that Christianity did not disband the hierarchical structure of pre-Christian Ireland but rather inserted itself into the already existing structure and modified it for its own purposes. [ix] A major impetus for this changing viewpoint is the work of the Oxford based scholar, Richard Sharpe, see Richard Sharpe, “Some Problems Concerning the Organisation of the Church in Early Medieval Ireland,” in Peritia 3 (1984): 230-270. Also the important study, Colman Etchingham, Church Organisation in Ireland AD 650 to 1000 (Maynooth: Lagin Publications, 1999, reprinted 2002). [xii]Charles-Edwards, Early Christian Ireland, 384. [xiii] Kathleen Hughes and Ann Hamlin, The Modern Traveller to the Early Irish Church, 2d. ed. (Dublin: Four Courts Press, 1997), 38-39. Liam Tracey, OSM, Celtic Spirituality: Just what does it mean? - Thinking Faith, the online journal of the British Jesuits. Richard Sharpe has offered a very helpful model of the possible range of churches which may have existed in the Early Christian period. At the highest level were the senior or chief churches, probably few in number where bishops were based and from where the training of clery and the pastoral work in the smaller churches were organized. These chief churches were often closely connected to secular kingdoms and in Tyrone it is reasonable to identify Ardstraw and Clogher as churches of the first rank. At the second level were churches which could be described as 'mother churches' responsible for organizing missionary work in the early period and later the pastoral ministry within an area. Bishops seem to have been based at some of these churches as well as at the chief churches. The clearest example in Tyrone is Donaghmore, already identified as an early missionary foundation. At the third level, and certainly the most numerous group, were the local churches with a church, a graveyard and a priest, who may have cared for several churches. The relations between the people and these churches are spelled out in legal sources and rules. The people received the sacraments, especially of baptism and burial, and in return paid the church dues and fees. The early Irish church was certainly not a 'monastic' church in the way that has often been claimed. It is increasingly accepted that although many written sources like saints' Lives, are couched in monastic terms, other sources make it clear that the monastic element from the 6th-century onwards, was only one aspect of a church which remained dominated by bishops. It is not at all clear whether monasticism survived to any great extent in the later centuries of the Early Christian period, and Richard Sharpe questions whether there was 'any general continuance of regular monastic life in Ireland in the ninth and tenth centuries'. A. Hamlin, 'The Early Church in Tyrone to the Twelfth Century' in C. Dillon and H.A. Jeffries (eds. ), Tyrone- History and Society (Geography Publications, 2000), 85-126 at 113. Sharpe's original paper, 'Churches and Communities in Early Medieval Ireland' can be found in J.Blair and R.Sharpe, eds., Pastoral Care before the Parish (Leicester University Press, 1992), 81-9. Concluding the paper by Henry Howorth on the Viking attacks on Ireland's monasteries. Whilst the author himself apologizes for the dry nature of the material, there are nevertheless some interesting snippets within it. He cites, for example, the prophecies about the attacks attributed to famous Irish saints. If nothing else, he certainly illustrates just how extensive these attacks were. Finally, I might add that most of the sources quoted by the author- Todd's Life of St Patrick, the Annals, the Chronicon Scottorum and the Tract on the War with the Foreigners are available through the Internet Archive. Besides ravaging this old foundation, we are told the pirates also plundered Connor, or Condere, in the county of Wicklow ("Annals of the Four Masters," 445). The Chron. Scot, also tells us that this year Clondolcan, near Dublin, was ravaged by them (op. cit., 139). This church was founded by Saint Mochua, who was its first abbot, and who flourished early in the seventh century. It subsequently rose to the rank of a bishop's see, and became a place of great celebrity. Of its original ecclesiastical edifices the tower alone remains (Petrie, op. cit., 393). This is, no doubt, of later date than the ninth century. A large granite cross, without ornament, which stands in the churchyard, was, however, probably there when the Norsemen made their attack. They also plundered Loch Bricren, i.e., the lake of Bricrum, so called from a chief of Ulster in heroic times. It is a small town, near a lake of the same name in the barony of Upper Inagh, in county Down. There Conghalach, son of Eachaidh, was taken prisoner and carried off by the foreigners to their ships, where he was killed ("Annals of the Four Masters,"447, 449, and note 2). The next year, i. e., 834, we are told Dunachadh, son of Scanlan, king of the Ui Fidgheinte (who inhabited a district in Limerick round the town of Groom), defeated the invaders and killed many of them ("Chron. Scot," 141; "Annals of the Four Masters," 449). The invasion of the great inlet of Limerick the outfall of the Shannon, which, dotted with its many islets, was a very paradise as a trysting-place for the fleets of the pirates, is told in greater detail in the Tract on the Danes in Ireland, where we read that they came into the harbour of Limerick, and that Corco Baiscinn (a district comprising the baronies of Moyarta, Clonderalaw, and Ibrickan, in the county of Clare), Tradraighe (a district in the same county, east of the river Fergus, whose name survives in the parish and rural deanery of Tradry), and the country of the Conaill Gabhra, or of the descendants of Conall Gabhra, who gave its name to the barony of Conelloe ("Wars of the Danes," xl., 9 and 31, note 7), which tribe, under their chief Donnchadh, or Donadhach, son of Scannlan (who was also head of the Ui Fidgheinte) together with Niall, the son of Cennfaeladh, the chieftain of Ui Cairbre, defeated them at a place called Senati, probably now represented by Shanagolden, in the barony of Lower Connello, in the county Limerick, where many of them were slain (" Chron. Scot.," 141; "Wars of the Danes/' xli., 9 and 224). This battle is dated in the year 834 in the "Annals of Ulster," the " Chron. Scot.," and the "Four Masters." The "Chronicon Scotorum " tells us further that the same year Glen da Locha, or Glendalough, was plundered by the pirates… Having pillaged Glendalough, the Norsemen also ravaged Slane, in the county of Meath, where there was formerly a round tower; and Finnabhair, abha, i. e., Fennor, in the barony of Duleek, in Meath, the burial-place of St. Nechtan ("Annals of the Four Masters," 449; "Chron. Scot." 384 ; Petrie, 164). The next year, i.e., in 835, we find them busy at their usual occupation of piracy at Fernamor (i.e., Ferns, in the county of Wexford), which was a foundation of St. Aidan, whose shrine was in the possession of Dr. Petrie (vide his volume, 201) Cluain mor Maedhoig (i. e., Clonmore, in the county of Carlow,) and other churches of Ir Mumban, i.e., Ormond (Chron. Scot.,141). The "Annals of the Four Masters" add the Church of Druimh Ing, a monastery of St. Fuintain, among the Ui Seaghain, a tribe and territory situated near Rath Ciule, in the barony of Ratoath and the county of Meath (op. cit.,45 1, and note d). The same year they made a descent upon Mungairid, now called Mungret, in far distant Limerick ("Chron. Scot.," 141; "Annals of the Four Masters," 45 1). A very ancient church, said to have been founded by St. Nessan, in St. Patrick's time, still survives there (Petrie, op. cit., 180). ”The wide range of these ravages," as Dr. Todd says, "proves they were committed by more than one body of invaders." The account for the most part is a mere dry list of names, as monotonous as the doings of the veritable Philistines which they record. In the Tract on the Wars of the Danes in Ireland, the attacks, as I have said, are not dated, but arranged in groups more or less geographical, but apparently very arbitrarily. Such a group includes the ravages just described, and adds some other names. Thus, after mentioning the expedition to Dunleer and Killessy (vide ante) we read that they returned again and plundered Swords of Columkille (i.e., Sord, near Dublin). It was a foundation of St. Columba's, and founded before the year 563 (Petrie, op. cit., 398). A famous round tower still remains there. This work also mentions Damliag of Cianan (vide ante), and Slane (id. ), and Killossy or Kiluasile (id. ), and Glendalough (id. ), and Cluain Uamha i.e., Cloyne, in the county of Cork, but probably a mistake for the Clurain Mor already mentioned), and Mungairt, and the greater part of the churches of Erin. …In 836 the Gentiles from Inbher Dea, i.e. the mouth of the river Vartry, in the county of Wicklow, where St. Patrick landed (Todd, "Life of St. Patrick," 338), and where the pirates doubtless had a trysting-place, attached Cildara, i. e. Kildare, and burnt half the church. 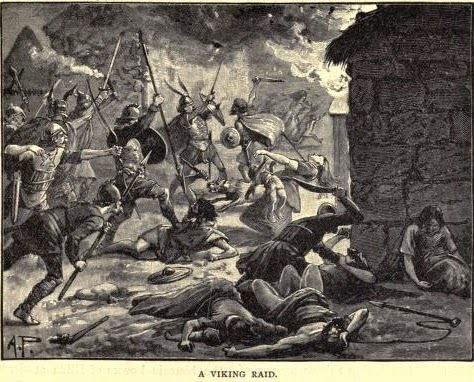 From the following sentence in the Annals it is not improbable that the Norsemen were in alliance with Feidhlimdh, the King of Munster already named, for it is said he captured the oratory at Kildare against Foran, the abbot of Armagh, with the congregation of Patrick, and took them prisoners" with their submission?" Kildare, "the church of the oak," was so called from a famous oak which was much cherished by St. Brigid (Todd, op. cit. 21). St. Brigid was the founder of the monastery there, which became one of the most fertile mothers of monachism in Western Europe. Her establishment comprised both sexes. They were separated from each other in the cathedral by a partition, which explains the statement of the Annals that the Norsemen burnt half the church. While she and her successors presided over the abbey, a regularly constituted bishop had joint authority with her, and looked after matters episcopal. He had his episcopal throne, "cathedra episcopalis," she her virginal chair ("cathedra puellaris"). While the Bishop of Kildare was the senior bishop of Ireland, she was the senior abbess among the Scots. St. Brigid and the bishop she appointed were buried on the right and left of the high altar respectively; and their shrines, highly decorated with pendent crowns of gold, silver, and gems, were preserved there. He had been a patron of the arts; had imported vestments of variegated texture from the Continent, which were then deemed peculiarly magnificent, and we are told he was St. Brigid's chief artist; Dr. Todd adds that the ancient Irish ecclesiastics did not consider it beneath their dignity to work as artificers in the manufacture of shrines, reliquaries, bells, pastoral staves, crosiers, covers for sacred books, and other ornaments of the church and its ministers. "The ecclesiastics of that period seem to have been in fact the only artists, and several beautiful specimens of their work are still preserved, chiefly belonging to the century or two centuries before the English invasion of Ireland; for almost all the older monuments of this kind, especially if formed of the precious metals, appear to have been destroyed or melted by the Danes" (Todd, op. cit., II 26). From this account it will be seen that the Norsemen doubtless found a rich booty when they plundered Kildare in 836. They followed up their attack there by a second raid on Cluain mor Maedhoig, or Clonmore, in the county of Carlow, which they assailed on Christmas Eve, and whence they carried off a great number of prisoners, and then cruelly ravaged all Connaught ("Chron. Scot," 141). The oratory of Glen da Locha was also burnt by them. The otherwise monotonous Annals have a curious notice this year, showing that nature was bountiful enough at these critical times; we read that there was abundance of nuts and acorns this year, and they were so plentiful that in some places where shallow brooks flowed under trees men might go dryshod, the waters were so full of them! The sentence following is in grim contrast to this. "The Gentiles this year harried and spoiled all the province of Connaught"("Annals of the Four Masters," 453; "Chron. Scot," 141.) In the same year the Four Masters have an entry which would be very curious and interesting if well authenticated; we are there told that "Goffraith, son of Fergus, chief of Oirghialla, i.e., Oriel or Uriel, in Ulster, went to Alba, i.e., Scotland, to strengthen the Dal Riada, at the request of Cinaeth son of Ailpin," i.e., Kenneth McAlpin (op. cit., 453). This early use of the Norse name Gofifraith in Ireland is very interesting, but Mr. Skene, than whom it would not be easy to quote a better authority, considers it as of slight value, and that it has been taken from the unreliable genealogy of the McDonalds, Lords of the Isles, contained in the "Book of Ballymote”(letter to the author). I am not so sure, however, that he has not here been too sceptical, and the entry is deserving of more critical sifting. A second entry occurs in the " Annals of the Four Masters," which tells us Goffraith died in 851. He is then styled Chief of the Inis Gall, i.e., Lord of the Isles, and if genuine, is the first recorded of that long and picturesque line of chieftains. The year 837 was also a terribly scarlet year in the Irish annals; we read how a formidable fleet of sixty ships appeared in the river Boyne, and a second fleet of sixty ships in the Liffey, and that these two fleets ravaged the districts of Magh Life (i. e. the plain of the Liffey in Kildare) and Magh Bregh the (plain of Bregia, between the Liffey and the Boyne, and extending from the sea into the county of Meath). The men of Bregh won a victory over them and killed six score of them ("Chron. Scot," 141). This victory, if victory it was, was compensated by a terrible reverse elsewhere, for we are immediately afterwards told that a battle was gained by the foreigners at Inbhear-na-Barc, i. e., the river or estuary of the barks or ships, which the learned editor of the " Annals of the Four Masters" identifies with the mouth of the river of Rath Inbhir, near Bray (op. cit., 455, note ), over all the O'Neills (i.e., all the southern O'Neills who lived in the ancient Meath), from the Shannon to the sea, in which such slaughter was effected as had never before been seen, but the chief kings escaped ("Chron. Scot," 141; "Annals of the Four Masters," 455,456). This was evidently a crushing disaster for the Irish, and it was followed by blow on blow of the heaviest kind, which are described in grim, short phrases by the chroniclers. By these blows the most famous religious establishments in Ireland were devastated, and all, too, apparently in one year. The list begins with Cluain-mac-Nois, assuredly a most famous monastic foundation, the most famous seat of religion and school of art in Ireland. It is situated on the eastern bank of the Shannon, in the barony of Garrycastle, in King's County…. The name Cluain-mac-Nois means the meadow of the son of Nois. The monastery there was founded by Saint Ciaran in 544. We are told that the king, Diarmaid Mac Cerbhall assisted Ciaran with his own hands to raise the humble edifice and the still humbler cell which adjoined it, the monarch being at the time himself an outcast, on whose life a price was fixed, and who was seeking shelter from his persecutors in the wilderness to which the saint had come for solitude and repose. The monastery afterwards became the cemetery of King Diarmaid and his successors, and was richly endowed by them. It gradually became the chief school in Ireland. In the eighth century Colcu, one of its lectors, was known abroad as the chief scribe and master of the Scoti. He was a correspondent of Alcuin, who sent him a present of some holy oil for consecration, shekels as a present from his master Charlemagne, and similar gifts from himself for the brotherhood at Clonmacnois, and other presents to be distributed elsewhere. Colcu was the author of a famous work called "Scuaip Chrabhaidh," i.e., the "Besom of Devotion." He died in the year 789 (Dunraven, op. cit., 96, 97). We shall revert to Clon-mac-Nois again, for it long survived this first attack of the Danes, and increased in wealth and splendour; but there is small doubt that even now the pirates found a rich booty there. Besides Clon-mac-Nois, we are told they in this year burnt the churches of Loch Erne, near Enniskillen, in the county of Fermanagh, such as Daimhinis, (i. e., ox island, now Devenish Island) in that lake. The monastery there was founded by Saint Molaise, otherwise called Laisren, who died there. A beautiful and perfect round tower still remains to mark the spot of the monastery, and the oratory of St. Molaise survived until a few years ago (" Annals of the Four Masters," 203, note t; Petrie, op. cit., 355, 432). They also plundered the church of Cluain Eos, or Clones, in the county of Monaghan, where there was another famous monastery, and burnt the churches of Laictene, Inis Cealtra, and Cill Finchi. Laictene was so called after Saint Lactin, who died in 622, and who had churches dedicated to him at Freshford, in the county of Kilkenny; Muscraighe, in the county of Cork ; and Ballylongford, in the north of the county of Kerry ("Annals of the Four Masters," 244, note g ; and 456, note e). Inis Cealtra was an island in Loch Dergdheirc ("Chron. Scot," 389); there was an ancient church there built, by Saint Caimin in the seventh century, and rebuilt in the tenth by the famous Brian Borumha, the object of so much affection on the part of Irish patriots (Petrie, op. cit., 272, &c.); while Cill Finnchi was a church described in a gloss to the Feilire Aenguis as near a great hill called Dom Buidhe in Magh Raighne in Ossory. This has not been identified, however (" Annals of the Four Masters," 456, note f). We next have a very remarkable reference, since it preserves for us the first name of a leader of the pirates recorded in the Irish Annals. The phrase in the " Chronicon Scoticon" is "the killing of Saxolbh, lord of the foreigners, by the Ciannachta," i.e., the men of Duleek in eastern Meath ("Chron. Scot," 143). The name Saxolbh is a curious one. It is clearly the Anglo-Saxon name Saxulf, and is not a Norse name at all. This proves that the Norse folk at this time were accompanied by some English chiefs, a fact which will be shown to have more than a passing interest presently. We then read of a slaughter of Gentiles at Carn Feradhaigh, which is a mountain in the territory of Clin-Mail in the south of the county of Limerick ("Annals of the Four Masters," 457, 245, note h; "Chron. Scot.” loc. cit). They, however, gained a victory at Ferta, i.e., the graves, probably Fearta fear Feig, on the Boyne near Slane, in Meath (" Annals of the Four Masters," 457, and note h;"Chron. Scot," loc. cit.). This was balanced by a defeat at Eas-ruaidh, now Assarae, at Ballyshannon, in the county of Donegal ("Annals of the Four Masters” 456, 457, note i; "Chron. Scot." loc. cit.). Lastly, we have the short and pregnant phrase, " The first taking of Athcliath by the foreigners." Athcliath is short for Dubhlinn of Athcliath, i. e., "the black pool of the ford of hurdles," and was the ancient name of Dublin (" Wars of the Danes," &c., xlix., note 5; "Annals of the Four Masters," and " Chron. Scot.," loc. cit.). Such is the calendar of destruction and ravage committed in the fatal year 837. The size of the fleet which then arrived, 120 ships, is enormous for a Norse armament, as all will confess who have studied the doings of the corsairs, and the record of its handiwork shows that it was a very powerful body of invaders, and no doubt therefore led by a famous chieftain. On turning to the Tract on the Wars of the Danes we recover his name, which was Turges, or Turgesius, which it has been suggested is a form of the Norse name Thorgils. As usual, in this account the story is confusedly told, and, as Dr. Todd has suggested, we seem to have the same story repeated in it in a different way. Confused as it is, we will now abstract the notice, which is no doubt very valuable. After mentioning the descent on Limerick (ante) this account goes on to say, "There came after that a great royal fleet into the north of Erin with Turges. This Turges assumed the sovereignty of the foreigners of Erin. The north of Erin was plundered by them, and they took possession of Leth Cuin (i.e. the northern half of the island, called Leth Cuin or Cons half; op. cit., 8, note 7). "A fleet of them took possession of Loch Eathach, i.e. Loch Neagh; another fleet took possession of Louth, another of Loch Ree" (op. cit., 9, 224, and xlii., note i). Here it will be seen three fleets are mentioned, and not two, as in the Annals. Then we have some paragraphs which are apparently inserted out of their order, and to which we shall revert presently, after which follows an account of the ravages as follows. "There came after that threescore and five ships (sixty is the number named in the Annals as forming each of the two fleets), to Dublin of Ath Cliath, and Laigin (i. e., Leinster) was plundered by them to the sea, and Magh Bregh" i.e., Bregia, already mentioned) (op. cit., 13, 226). This story is clearly a condensed account of what we have already recited from the Annals; but at this point we get a very interesting additional phrase, for we are told that this fleet, after the plundering of Laigin and Bregia, went northwards with its left hand towards Erin, and the Dalriadans gave them battle. They were led by their king Eoghanan, the son of Angus (who according to O'Flaherty was the 31st of the Dalriadan kings of Scotland), who was killed, (" Wars of the Danes," 13, 226). The Ulster Annals tell us expressly the battle was fought in Fortrenn or Pictland, and besides Eoghan he tells us that Bran the son of Angus and Aid the son of Boareta, and an almost innumerable body of people, perished there ("Skene's Celtic Scotland," 307-8, note 7). These Annals date the fatal battle in 838, which answers to 839 of our era (Todd, loc. cit"). The fight here described was one of the most important battles in history. In Mr. Skene's words, "The Picts received so crushing a blow from the Danish pirates, that it seems to have almost exterminated the family connected with Fortrenn, and paved the way for the successful attempt of the son of Alpin the Scot to place himself on the throne of the Picts"(id., 307). It was doubtless a consequence of this victory that, as we read in the " Chronicle of the Picts and Scots," the Danes devastated Pictland as far as Cluny and Dunkeld (id., 310, note 66). It seems clear, from the petty doings of the Norsemen in Ireland in 838, that a large part of the royal fleet, after gorging itself with booty from Ireland, had gone to Scotland, as I have mentioned. In 838 we have but one entry about "the Gentiles," where we are told they defeated the people of Connaught, and that Maelduin, son of Murighes, son of Tomaltash, and others were killed ("Chron. Scot.” 143;"Annals of the Four Masters," 459). In 839 we read that a marine fleet of the foreigners arrived in Loch Eathach (i.e. Loch Neagh), and the territories and churches of the north of Ireland were spoiled by them. The Annals of Clonmacnois say they built a fortress there. This was no doubt the fleet of Turges which had returned from the Scotch expedition, and explains the mention of the third fleet on Loch Neagh in the confused narrative of the "Tract on the Danes in Ireland." The same year Ferns, in Wexford, and Cork were again ravaged ("Chron Scot.” 143; "Annals of the Four Masters," 459). This was probably by another section of the invaders. In 840 the party who had settled on Loch Neagh attacked Louth, and made prisoners of many bishops and other wise and learned men, and carried them to their fortress, after having slain many others (" Annals of Ulster," quoted in " Annals of the Four Masters," 460, 461, and note d). This event is confused, by the " Tract on the Wars of the Danes in Ireland," with the previous capture of Armagh, when it was taken three times in one month, and no doubt by quite a different section of the pirates. The mistake has led to a misplacement of the paragraphs in that narrative, and to a confusion of the chronology of Turges' expedition in Dr. Todd's narrative. The notice to which I refer runs as follows: "Moreover Armagh was plundered by them three times in the same month, and Turges himself took the abbacy of Armagh, and Forannan, abbot of Armagh, was driven away and went to Munster, and the shrine of Patrick with him, and he was four years in Munster, while Turges was at Armagh, and the power of the north of Erin was with him" (op. cit., 9, 224). This proves that a confusion in the dates has arisen, for as Forannan returned in 845 and was absent four years, it seems to show that the capture of Armagh referred to was the later one, and not the earlier, which has been mixed up with it. The capture of the famous old foundation of St. Patrick, and the eviction of his successor, are said to have been foretold by several of the old saints, and the Annals quotes from three of them prophecies which are very clearly ex post facto. Of them shall be power over Erin. The Gentiles of the port of Dublin. Without Latin, and only knowing a foreign language." Has well exalted the foreign Gentiles. It shall be the rule of a usurper." Parties of Danes of the black ships." This is explained in the context, as meaning that the Danish invasions were in punishment, first, of the banishment of St. Columba to Scotland ; secondly, the sacrilegious insult offered to Ciaran, of Clonmacnois, by King Diarmaid, in Tailtin, or Teltown, doubtless referring to the false oath sworn on the relics of his hand by Ambacuc in the year 544 (" Chron. Scot.," 49) ; and lastly, for the fasting of the saints of Erin against Diarmaid MacCerbhaill. This refers to the fact that Diarmaid was largely infected with Druidic notions, and was a patron of the Druids, and in consequence incurred the displeasure of St. Columba, who denounced him (see Todd's "Patrick," 118, &c.). Let us now return once more to the Annals. Under the year 840 we are told that the foreigners who still remained at Loch Neagh built themselves a fortress at Linn Duachail, probably situated at the tidal opening of the Clyde and the Dee, in the county of Louth, where the village of Annagassan stands (" Wars of the Danes," Todd's note, Ixii., note i). Thence they plundered the churches and territories of Teabhtha, or Teffia, a territory comprising portions of the present counties of Longford and Westmeath. They also built a fortress at Dublin (doubtless where the castle still stands), whence they harried Leinster and the land of the southern O'Neills as far as Sliabh Bladhma (i.e., the Slieve Bloom Mountains in King's County, to which the land of the southern O'Neills extended) (" Annals of the Four Masters," 461, note g). They also plundered Cluain Edhnech, i.e., Clonenagh, the famous monastery of St. Fintan, in Queen's County (" Wars of the Danes," lxi., note g), and demolished Cluain Iraird, i.e., Clonard, in the county of Meath, the foundation of St. Finnian, called the foster-father of the saints of Ireland. His celebrated school at Clonard is said to have produced 3,000 disciples, and as Dr. Todd says, it became the alma mater of many eminent ecclesiastics. The famous saints known as the twelve apostles of Ireland were his disciples (Todd's "Life of St. Patrick," 98). St. Finnian died in 551. Besides this seat of learning the invaders also laid low Cil Achaidh, or Cil Achaidh-Droma-forta (i.e., the church of the field of the long ridge), now Killeigh,in King's County, founded by Saint Sinchell, who died of the plague in 549. The next year was again a red year in the Annals. We are told the Gentiles were still at Dublin. Those at Linn Duachaill again plundered Clonmacnois and also Cennetigh, now called Kinithy, in King's County, where there was a monastery ("Chron. Scot," 145; "Annals of the Four Masters," 463, note j). Another fleet of them was stationed at Linn Ross, on the river Boyne. Linn Ross, or the pool of Ross, was that part of the river Boyne which was opposite Rosnarea, in the barony of Lower Duleek, in the county of Meath (" Annals of the Four Masters," 462, note q). Another fleet was at Linn Suileach, doubtless an ancient name of Loch Suilach, or Loch Swilly, in Donegal ("Annals of the Four Masters” 463, note 2). It was apparently from Dublin (" Annals of Ulster," quoted in "Annals of the Four Masters," 463, note s) that issued those who plundered Birra, a foundation of St. Brendan, who died in 565 or 571, now called Parsonstown and Saigher, i.e., Seir Keiran in Ballybritt, King's County, where was the principal church of St. Kiaran. Disert Diarmata (i.e., Saint Diarmaid's desert hermitage or wilderness) was also devastated, the body who plundered it coming from Kaeluisge (i. e., the narrow water, now Narrowwater), situated between Warren's Point and Newry in the barony of Upper Iseagh, in the county Down ("Annals of the Four Masters," 462, note p). "Disert Diarmata was the ancient Irish name of Castle Dermot, in the baronies of Kilkea and Moone, near the southern extremity of the county of Kildare, where Diarmaid, son of Aedh Roin, erected a monastery about A.D. 500. In the churchyard there are to be seen an ancient round tower and several curious crosses, which attest the antiquity and former importance of the place" (id., note o). Three important victims of the pirates are mentioned by name this year; these were Caemhan, abbot of Linnduachaille, who we are told was mortally wounded and burnt by the Gentiles, the "Annals of Ulster" say by the Irish and Gentiles (" Annals of the Four Masters," 463, note s; "Chron. Scot.," 145). They also killed Moran mac Inreaghty, Bishop of Clogher (id. ), and they captured Maldinn MacConal, king of Calatrom (i. e., Galtrim in Meath), who was killed three or four years later by the people of Leinster. During the next two years the entries in the Annals about the Norsemen are very scanty, proving doubtless that a large part of their fleets were busy buccaneering elsewhere. This is a good halting-place. The pirates now began a series of much more important raids upon the fair lands of France, while their course in Ireland also took a new departure. Much of this paper consists of arid detail, because the ground is largely new and untrodden, and we have to carve our way through a thicket which is dense and confused; but the very dryness of the details and their iteration proves the terrible way in which the culture and civilization of early Ireland was laid low at this time by the pirates. Transactions of the Royal Historical Society Volume VIII (1880), 281-330. The Vikings are a favourite subject of historical revisionism these days, gone is the image of the fierce pagan marauders on which my generation was raised and instead we are encouraged to think of the Vikings primarily as traders, farmers and settlers. A Greek Orthodox friend of mine is perplexed by our rehabilitation of the Vikings and the sense of pride which the Irish take in promoting Viking festivals and the like. For him the Vikings are those who assaulted the Irish monasteries, martyred our monks and destroyed relics so what is there to celebrate? Maybe this question would have made sense to the gentleman antiquarian who authored the paper below, one of a series on Viking attacks on Ireland and Britain. Writing in 1880, Henry Howorth compiled a full dossier of information from the Annals on the assaults on Irish monasteries. I have omitted his lengthy introduction and various other sections to concentrate on the details of the Viking raids. The paper can be read in full online if you want the extra detail. In this first section we are going to look at the period from 795 until 832. THE IRISH MONKS AND THE NORSEMEN. By HENRY H. HOWORTH, ESQ., F.S.A. ....The attack on Ireland in 795 was, a very transient matter, and only affected one of the small islands on the coast. They did not appear there again for some years. Their next attack was in 807, when we read in the Chronicon Scotorum, "Burning of Inis-Muiredhaigh by the Gentiles, and devastation of Roscam. The moon was turned into blood " (i.e., was eclipsed). This is the first record we have of any attack made by the Northmen on the mainland of Ireland. Its date is fixed by the eclipse just mentioned. In the Art de Verifier les Dates, i. 67, it is given under the year 807. The Anglo-Saxon Chronicle also names it, dating it, however, on the 1st of September, 806 ("Chron. Scot," 126, note i). Inis-Muiredhaigh, or Inis Murray, as it is more generally known, was a famous monastic site. The island is situated in the Bay of Donegal, about five miles from the coast of Sligo… The island was known by its present name as early as 747, and it probably took its name from Muiredach, a follower of St. Patrick, put by him over the church of Killala, and who also probably founded the monastery. 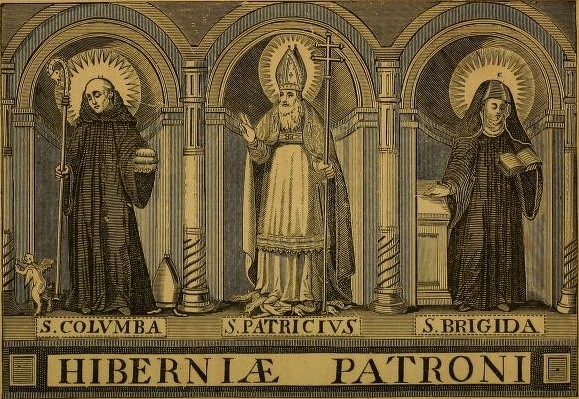 A century later St. Molain, a contemporary of Saint Columba, was abbot of the place and founder of the old church bearing his name there, which therefore dates from the sixth century… Inis Murray was clearly a very important monastic foundation. It was also easily accessible from the Hebrides, where the rovers probably now had settled quarters. Having burnt the monastery on the island, they went over to the mainland, and penetrated into the very heart of Connaught, where they devastated Roscommon. …We do not again read of the invaders till 811, when they made a descent upon Ulster, where, we are told, a slaughter was made of them.("Chron. Scot." 127). The next year we find them in Connaught. They were there beaten by the men of Umhall or Owle, a district comprising the modern baronies of Murresk and Burrishoole, in the county of Mayo. By this defeat we are probably to understand that, as usual with them, having made a descent and being resisted they retreated and went on, for we are told that they, the same year, slaughtered the men of Conmaicne, i. e., of Connemara, in Western Galway. They advanced yet further and made an attack on Munster. According to the Tract on the Wars of the Danes in Ireland, this fleet numbered 120 ships, a most important armament and doubtless a royal fleet… This fleet, according to the Tract just cited, went to Camas ó Fothaidh Tire (i.e., the fair island of Forthaidh), or, says Dr. Todd, perhaps of Ui Rathaigh (probably the island of Ui Rathaigh in Kerry being meant), and they plundered and devastated it and Inis Labhrain (probably some island on the river Cashen in Kerry), and also Dair Inis (i.e., the oak island). Thence the invaders seem to have advanced inland, where they were beaten by Cobthach, son of Mach Cobha, chief of the Eoghanacht of Loch Lein, a tribe which lived east of Killarney, in the barony of Magunihy and the county of Kerry. On this occasion 416 of them were killed ("Wars of the Danes in Ireland," 5 and 222; "Chron. Scot," 127; and "Annals of the Four Masters," 419). This means that the invaders were very severely beaten indeed, for 416 must have made a great gap in their not very large armament. We are not surprised therefore to find the defeat a subject of European notoriety. Eginhardt in his Annals tells us that in 812 a fleet of Northmen having attacked Ireland was defeated by the Scots. Many of the invaders were killed, and the rest returned home ignominiously (Pertz, I., 199, 200; Kruse, 66). The same event is mentioned in the annals of Fulda, where the invaders are called Danes, and in the Annales Ottenburani. It was doubtless on their return journey that, in the following year, i.e., in 813, the men of Umhall or Owle were slaughtered by them, and that Cosgrach, son of Flannabhrat and Dunchadh, king of Umhall, perished ("Chron. Scot," 129). The invaders seem altogether to have learnt a severe lesson on this visit, for we do not again hear of them for nine years. When their attacks began again it was, as I believe, from an entirely different quarter; and I will now try and trace them out. We read in the Frankish annals, that in the year 820 a fleet of thirteen ships from Normania appeared on the coasts of Flanders, but were driven off by the coastguards there, after burning some small houses and carrying off some cattle. They then entered the estuary of the Seine, where they were also routed by the guards and lost five of their number. Then going on towards Aquitaine they destroyed a town there called Bundium by Eginhardt, and Buin in the Vita Ludovici, and whose site seems not to be known. Hence they carried off a vast booty and returned homewards ("Eginhardt Pertz," i. 207; " Vita Lud." id. ii. 625; Kruse, 79, 8o). Kruse has argued with some plausibility that this fleet was commanded by two chieftains, brothers of Eric, the Danish king, who had been expelled from their country the year before (pp. cit. 80). The question is whither did they go after leaving Aquitaine. 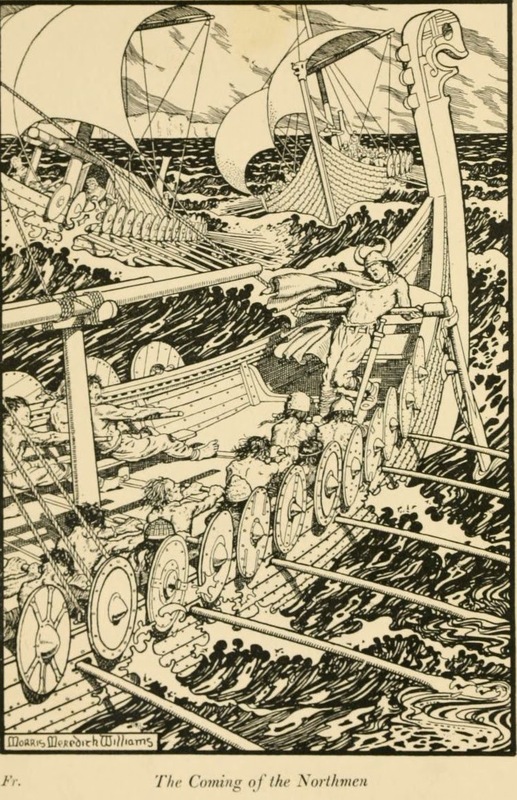 It is curious that in the year 821 we again read of the Norsemen in Ireland, not in the north, where they would naturally have appeared if they had come from the Hebrides or Scotland, but on the south-east coast, facing the coast of Gaul. This makes it not improbable that the invaders were the same or a part of the same fleet which had been busy in Aquitaine…. As I have said, we read of a Danish invasion of the east coast of Ireland in the year 821 or 822. The "Annals of the Four Masters" tell us they attacked Edar, (which was the ancient name of the peninsula of Howth, near Dublin,) and carried off a great prey of women. They also plundered Beg Eire, i.e., Little Ireland, now Begery, a small island close to the land in Wexford harbour, on which was a church built by Saint Ibhar, who died in the year 500 ("Annals of the Four Masters," 431, notes y and z]. They also plundered Dairinis Caemhain, i. e., St. Camhain's oak island in Wexford harbour (id. and note a). St. Camhain was brother of St. Kevin of Glendalough, and was apparently also the founder of a church in one of the Arran islands (Lord Dunraven's "Irish Architecture," i. 86). The next year we find them creeping along the coast further west, and attacking Cork and Inis Doimhli, probably not far from Cork ("Chron. Scot.," 131; "Annals of Four Masters," 433). According to the Tract on the Wars of the Danes, they also ravaged Cloyne and Rosniallain, or Roskellan; perhaps, says Dr. Todd, Rostellan, a parish in the barony of Imokilly, in the county of Cork. These places they plundered. In the same year we are told in the Ulster Annals that the Gentiles spoilt Lusca, in the modern county of Dublin, and wasted Cianachta (i. e., a territory situated in the baronies of Upper and Lower Duleek in the county of Meath) as far as Ochtar Ungen (? Ocha in the county of Meath, near Tara), and afterwards they spoiled the Galls of the north-east, i. e., of Scotland (" Annals of the Four Masters," 1,440, note i). This is doubtless the same event mentioned in the Chron. Scot., where we read that Blathmac, son of Flann, was martyred by the Gentiles at Iona ("Chron. Scot.," 133). According to the metrical life of this saint, by his contemporary, Walafred Strabo, which is still extant, he was of royal descent and heir to a throne in Ireland, but devoted himself to a religious life, and became the head of a monastery. Coveting the crown of martyrdom we are told he sought the dangerous neighbourhood of Iona, then presided over by Diarmaid, who in 818 had taken the shrine of Saint Columba there from Ireland ("Chron. Scot," 131). This seems to show that the Scottish isles were, at that time, unmolested by the pirates. When he learnt of the approach of the invaders he addressed the brethren, and bidding those who could not face the danger depart, he and others determined to stay and oppose the intruders. The chief objects of Danish cupidity on these occasions were the gold and bejewelled shrines enclosing the precious bones of the saints. The shrine of Saint Columba was now taken from its place, buried and covered with sods. We are told that St. Blathmac was celebrating Mass when the invaders fell upon the island. They put many of the monks to the sword, and then turned upon the Saint and demanded the precious reliquary, all showing that the monastery had been in a measure rebuilt since its former destruction. He had purposely remained ignorant of its hiding place, and, we are told, spoke to the enemy in the barbarous tongue, i.e., in Norse, which was assuredly a most curious accomplishment for an Irish ecclesiastic at this time. He said, "I know not truly what gold ye seek, where it may be placed in the ground, and in what recesses it may be hid; but if it were permitted me to know, Christ permitting, never would these lips tell this to your ears. Savagely bring your swords, seize their hilts and kill. O God I commend my humble self to thy protection." Thereupon they cut him in pieces (Skene, 2, 302 and 303). Diarmaid, the abbot of Iona, apparently escaped, and four years later, i. e., in 829, we find him going to Scotland with the Meonna of St. Columba, which is explained by Dr. Reeves as the articles of veneration of the saint, such as his crozier and his books or vestments, as distinguished from his ashes, and which he had doubtless saved in his flight (id. 303)…. Let us now revert once more to Ireland. Still referring to the year 825, the annals report the destruction Dun Laighen at Druim, by the pagans, in which Conaing, son of Cuchongelt, lord of the Fortuatha was slain with many others ("Annals of the Four Masters," 441). Fortuatha Laighen was the district in which Saint Patrick first landed, and was situated in the county of Wicklow (Todd's "St. Patrick," 286 and notes). During the next two years we do not read of any attacks made upon Ireland by the pirates, and strangely enough it is during this interval we find them on the coasts of Gaul again. The coincidence is certainly strange, and one fact, probably, explains the other… It was in 832, however, that they made a much more important attack upon Ireland. The times were favourable to them. There was at this period a persistent feud among the Irish princes, which had lasted for more than a century, owing to the pretensions of the chief of Cashel in Munster to be acknowledged as overking of all Ireland. This claim was at this time hard pressed by Feidhlimidh son of Crimhthan the chieftain of Munster. The way in which the capture of this northern ecclesiastical capital of Ireland is mentioned, when we are told that it was taken three times in one month, shows that there must have been some very hard fighting there. The Chron. Scot, after mentioning the plundering of Armagh, speaks of the devastation of Lughmhagh, that is of Louth, where there was a famous monastery founded by Saint Mochta, a disciple of St. Patrick, which was so rich that he was able to support there without requiring them to work for their livelihood, and while engaged altogether in the pursuit of learning, three hundred priests and one hundred bishops, with sixty or, according to another reading, eighty singers; and these numbers constituted the ordinary monastic family or household of the monastery (Todd, op. cit., 29). Besides Louth, other neighbours of Armagh suffered on this occasion, as Mucsnamha, now Muchnoe, in the county of Monaghan, the district of the Ui Meith Macha in the same county, and Druim Mic Ua Blae, or Druim Hubhla, situate in the baronies of Upper and Lower Slane, in northern Meath, where a church dedicated to Saint Sedna was renovated in the ninth century, but which no longer exists ("Annals of the Four Masters," 445; "Chron. Scot.," 139). The same year they laid waste Daimhliag Cianain (the stone church of Saint Cianain), founded by a disciple of St. Patrick's named Cianan, and now called Duleek, in the county of Meath. They also carried off Ochill the son of Colgan. The Chron. Scot., besides the capture of Duleek itself, also mentions that the territory of Ciannachta (i.e. a tribe settled in the present baronies of Upper and Lower Duleek in the county of Meath), with its churches, was also spoiled. Tuathal, son of Feradach (about whom I can find nothing) was carried off by them, and the shrine of Saint Adamnan was taken away from Domhnach Maghen (i.e., Donaghmoyne, in the barony of Farney and the county of Monaghan Reeves,"Adamnan," 389). It was the same invaders, doubtless, who ravaged Cill Uaisaille (the church of St. Auxilius), now Killashee, near Naas, in the county of Kildare, which adjoins Meath. The Chron. Scot, also mentions a plundering of Lismore in southern Ireland in the same year (op. cit., 139 ; "Wars of the Danes," xl.). The church at Lismore was founded by the famous St. Carthach or Mochuda, who was its first bishop, and who having died in 637 was buried there (Petrie, op. cit., 240). Lis meant the wall of earth or stones which enclosed the cashel, and Lismore therefore meant merely the great wall or great rampart (id. 441). The very ancient fragment of the work on the "Wars of the Danes," contained in the book of Leinster, says that after plundering the various places about Kinsale already named, the invaders went north to Snamh Aignech, i. e., Carlingford Loch, where they spoiled Lann Lere, i.e., Dunleer in the county Louth ("Wars of the Danes," &c.,xl. and 224), and Cill Shleibhe, now Killevy, near Newry, at the head of Carlingford Loch. look round on me, Lord. David Howlett, ed. and trans. The Celtic Latin Tradition of Biblical Style (Dublin, 1995), 154-55. St. Aedhan, Mac Ua Duibhne. The published Martyrology of Tallagh has a record, at the 8th of April, regarding a festival to Aedan Mac h. Suibne. Marianus O'Gorman enters a St. Aidan, at this day. Colgan thinks, he must be identical with a Scribe or Chronographer of Durrow, in the King's County, and whose death is recorded, in the Annals of the Four Masters, under A.D. 827. At another reference, where Colgan enumerates various saints, who bore the name of Aidan, in his Appendix to the Acts of St. Maidoc, also called Aidan, or Aedan, he introduces the present holy man, known as Aidanus filius Hua Duibhna.The Bollandists have entered his feast, at the 8th of April, as Aidanus filius Hua-Dubnei. Thus, uncertainty prevails regarding him. Aedhan, Mac Ua Duibhne, was venerated, on this day, as we read in the Martyrology of Donegal. We have an entry of the name, Ruissen, Innse Pich, in the Martyrology of Tallagh, at the 7th of April. The name of this place has been assigned to Muscraige, a territory in Munster and, again, it has been placed, by Colgan, among the Islands of the Picts. However, the denomination is at present supposed to be obsolete. This saint was the same, we are told, as Ross, or Rus, son of Trichem, son of Fica, son of Iomchadh, who belonged to the race of Fiatach Fionn, king of Erinn. If so, he was brother to Dichuo, or Dichu, who was the first to embrace the faith, in the northern parts of Ireland. The story of his life is to be met with, in various Acts of St. Patrick, among whose disciples he is classed. He lived, at a place, called Derluss, a town in the southern part of Ulster; and, afterwards, it was known as Inreathan. It is now called Bright, and there, he seems to have resided. For further particulars related concerning him, the, reader is referred to the Life of St. Patrick, already written. Rus, or Ros, is said to have been of Dundaleithglass, the old name for Downpatrick, which was the ancient seat of the Ulidian Kings, and where they lived in the strong fort, known as Rath-Keltair, quite near the cathedral. A doubt seems to be implied, as to whether the feast of St. Rus, or Ross, belongs to April 7th, or to April 9th; but, the latter figure seems to have been a misprint, for the 29th. The Bollandists ' commemorate Russonus de Insula Pich, on the 7th of April. There seems to me, however, that some confusion, in the attempt to identify St. Ruisen, of Inse Pict, or Inis-Puinc, with St. Ross of Downpatrick, must exist. An ancient Sanctilogy represents this latter person, as having been a brother to Dichu, one of St. Patrick's first converts in Ulidia ; and, therefore, not only must the church of Downpatrick have been erected, at a very early date, but we ought even regard this Rus or Ross as presiding over it, some time in the fifth century. Although the father's name and the place seem different, yet St. Ruisen of Inis Pict may probably be identified with a Russ, or Russen, son to Rodan, Abbot of Innisfreil. A conjecture has been offered, likewise, that this saint was identical with the Ruissin, son to Lappain, mentioned in the Life of St. Molagga. He died, it is said, A.D. 658, the comorban to St. Barr of Cork. And, we are told, moreover, that Marianus O'Gorman, as also the commentator on Aengus, say, this saint's Natalis was celebrated, on the 7th of April. Again, we have an account of St Russeus, or Russenus, the son of Rodan, who was one of St. Columba's companions, when his first missionary expedition to Britain was undertaken, and whose festival has been assigned to the 27th of December, by some Scottish writers ; but, Colgan thinks, it ought rather be referred to the 7th of April, as noted in the Martyrologies of Tallagh, of Donegal, of Marianus O'Gorman and of Maguire. He flourished, A.D. 563, but the date for his death is uncertain. The Martyrology of Donegal, this day records a festival, in honour of Ruisen, of Inis-Picht. The Bollandists merely notice this Feast. The Martyrology of Tallagh records, at this date, Ordinatio Patricii. Whether this entry, meaning, "the Ordination of St. Patrick," refers to his sacredotal ordination, or to his Episcopal consecration, cannot be exactly determined. It is probable, however, it must be coupled with the latter, as more in accordance with ecclesiastical usage. Even at the present time, it is customary, to commemorate the anniversary of a Bishop's consecration, by a prayer, added to the Mass, offered on that day, within his own diocese. In the published Martyrology of Donegal, the editor remarks in a note: The more recent hand adds here,'Ordinatio S. Patricii, Mart. Taml,' as if it were deemed by the writer a matter of importance, to supply an obvious omission of the compilers. Feast of Saint Patrick's First Baptism, in Ireland. Which he performed in Erinn." St. Gallus, of Loch Techet, now Lough Gara, Counties of Roscommon and Sligo. A distinguished statesman has observed, that there is no greater folly being circulated on the earth, than a disposition to undervalue the records of the past, and to break the links, which united human beings of the present day, with the generations that had been called to their account. The Martyrology of Tallagh, at the 4th April, inserts the notice, Gall, Locha Teiget. This lake, at present, is known as Lough Gara, or Lough O'Gara, near Boyle, and on the borders of the counties of Roscommon and Sligo. The river Boyle has its source from this lake. We are informed, that St. Patrick, while in Connaught, resolved to visit Moylurg, and that passing through Bearnas Hua Noililla, or the gaps of Collooney, he moved onward towards the River Buill—now the Boyle—which takes its rise in Loch Techet.' According to the Martyrology of Donegal, on this day was venerated Gallus, of Loch Techet, and in the Bollandists' work he is likewise commemorated. The Sons of Geran, or Goran. Who these holy persons were has not been known, nor can it be ascertained, at what particular time they flourished. In the published Martyrology of Tallagh, the entry, Mic or "sons of" Gerain, at the 1st of April, will be found, although incorrectly placed by the scribe. The Bollandists notice them, as "Filii Gorani," at this date, and on the same authority. On this day was celebrated a festival, in honour of The Sons of Gerán, as we find recorded, in the Martyrology of Donegal.